Despite our best efforts, sometimes we find ourselves with a few plastic grocery bags in hand. While some toss them carelessly out into the trash, the Eco-Bin gives you the option of reusing them as trash bags. 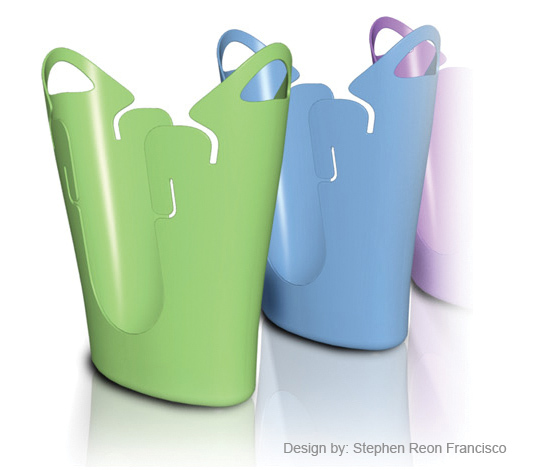 Designed by Stephen Reon Francisco, this stackable bin is available in a variety of different colors, so you can pick up a different color for separating and storing your recyclables. Each bin can hold up to 5-10 bags depending on their thickness. @eleven47 that is the problem with the "fake" eco culture. Prius is a great example of this. However I believe that inventions and gadgets like this bin encourage people to think differently and remind them to act differently as well. Sort of feel this is "un-eco". The creation of another piece of plastic instead of re-tasking something already in existence. My mother has been reusing her plastic bags for years and using just her old bin as a holder. Cool idea, if only plastic bags were not banned where I live. They banned thin plastic bags, no everyone has to buy thick garbage bags for their bins.